Home » Weaved or Woven – Which is Correct? Sometimes, there is more than one way to conjugate an English verb into a given tense. These occasions are rare, but they do happen. Weaved and woven are both correct past participle conjugations of weave, but since they are correct in different contexts, they are not interchangeable. 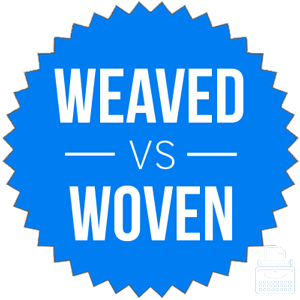 What is the Difference Between Weaved and Woven? In this post, I will compare weaved vs. woven and use each word in example sentences that will display it in its appropriate context. I will also show you a mnemonic device that will help you choose the correct word, either weaved or woven, each time. What does woven mean? Woven is a past participle conjugation of the verb weave. As a verb, weave has two meanings, one of which is to sew threads together to form fabric. This meaning can also take on a figurative form where it means to make a complex story from a number of inter-connected parts. The verb weave is an irregular one, which means it does not follow the regular rules of English verb conjugation. As you can see in the above conjugation chart, both woven and weaved are past participles of the verb weave. Past participles are used with helping verbs like has or had to indicate something that had already been completed at the time the speaker mentioned it. They form the perfect tenses. These two past participle forms, weaved and woven, are used in different contexts. When you are talking about the threading or interlacing of fabric or figurative, abstract elements, use woven. Weaved is only proper in one, limited sense (see below). What does weaved mean? Weaved is another past participle form of weave. As I’ve mentioned, weave has two important meanings as a verb. The first meaning has to do with the sewing of thread. This can take a literal or figurative sense, and we went over this in the section above. The second meaning is to zigzag back and forth, like a gazelle weaving through the trees or a midfielder weaving through defenders. In this sense, weaved is the correct past participle form. The detective weaved in and out of the crowd as he shadowed the suspect through Grand Central Station. The thief’s path weaved into and out of several shops and booths on his way to the jewelry cart on 4th avenue. What is the Past Tense of Weave? So far in this post, there has been a lot of talk about the past participle of weave. Well, what about the past tense of weave? As is the case with the past participles, the past tense for weave depends on the context. When talking about moving in a zigzag fashion, weaved in the past tense. In all other uses, wove is the past tense. The gazelle weaved through the grass. The seamstress wove the fabric. The movie director wove the plot. Weaved and woven are both correct conjugations of weave. The only difference is context, namely, how you are using the verb. If you are describing threads stitched together into fabric, choose woven. Is it weaved or woven? Woven and weaved are past participle conjugations of the verb weave. Woven is correct in the context of fabric. Weaved is correct in the context of a zigzag motion. Both are correct, but they are used in different contexts. 1 What is the Difference Between Weaved and Woven? 4 What is the Past Tense of Weave?